Robert the Bruce | O James, Who Art Thou? 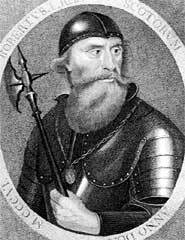 I found today that there is a connection from my family to the de Brus line as well — if the research holds, I’d be King Robert’s third cousin many times removed (and yours)! Genealogy is an interesting thing for sure!